I was 4 and my parents owned a shop. I took litres of milk and dozens of eggs and I prepared a huge mayonnaise outside in the sand pit ! I think it’s always been within me. But two persons inspired me : Fredy Girardet (Swiss) et Baron Pierre Romeyer. I really favour two of them : creation and transmission. I’m a man of communication, you see. What do you like to do when you do not cook ? Oh, that’s a tough one because live for my cuisine ! (thinking, scratching his head) I like to go out to the theatre to watch a good play. Yes, I’m doing this job to offer happiness and pleasure to others. Simply the passion I have for this job. 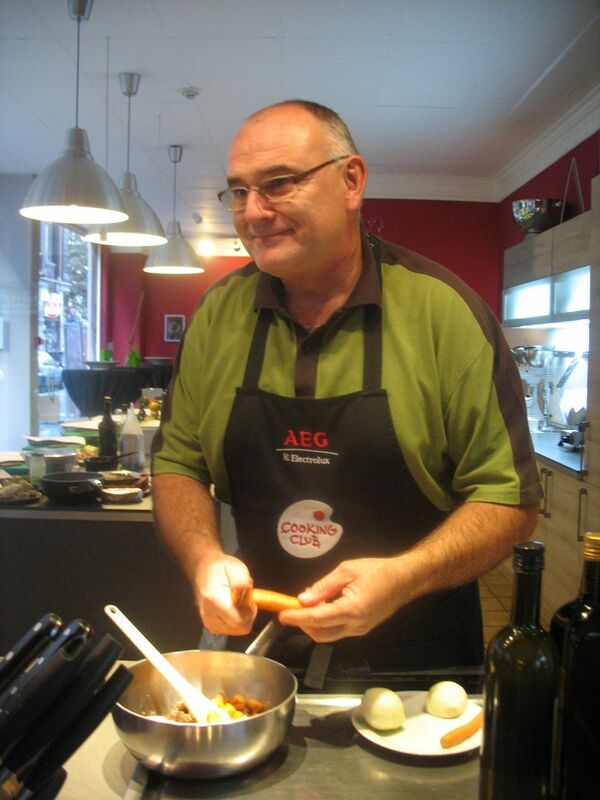 I want to instruct corporate catering cooks throughout Europe. I have developed this here in Belgium and now I’ve got opportunity to do so in Italy. Ah, 9 out of 10 ! Recently, I made the decision to totally devote my life to cooking and I feel free ! (hesitates) Bus driver because they are bullied by travellers. (immediately) A birch. I would already harvest the sap when I was a kid. That Humankind is a bunch of twats !